Green peas are a high protein food and a good source of vitamins, minerals and dietary fibre. The chief among them are thiamine, folate, vitamin C, phosphorus, potassium, magnesium and calcium. All these vitamins and minerals have important functions in the body. 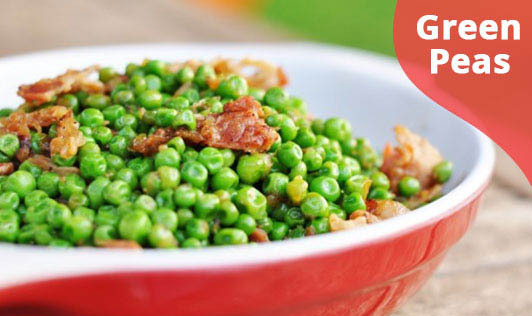 Green peas provide 92 Calories per 100 grams and contain 16% carbohydrates. These complex carbohydrates release energy slowly to the body and help to maintain a consistent energy level. Peas blends well with other vegetables and are best used for thickening soups, for preparation of vegetarian gravies, rice varieties, salads etc. Various food processing techniques such as drying, canning and freezing makes peas available throughout the year.